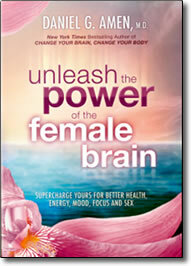 Unleash the Power of the Female Brain – DVD by Dr. Daniel Amen – Save! Dr. Amen has helped countless individuals improve their brain and body function, reduce depression and anxiety, ADD, lose weight, and feel better. Now he turns his attention to the unique needs of the female brain. In a recent study of the male and female brains, the female brain was typically more active. That means it’s even more important for women to pay attention to brain health and function in order to improve mood, endurance, health and personal happiness. Women are more naturally programmed for multitasking, cooperation, empathy, intuition, discipline, and, yes, worry. These can be strengths or weaknesses, depending on how the brain is nurtured and nourished. You’ll learn how to eliminate the innate frailties of the female brain and turn them into strengths. You’ll learn 5 keys to tap the awesome power of the female brain. How to deal with specific brain issues that women face such as ADD, anxiety, depression, obesity, and memory challenges. Dr. Amen discusses the brain-hormone connection. You’ll learn how to regulate your level of hormones to quiet your mind, ease anxiety and worry, and improve your feeling of happiness. Finally you’ll learn how to pass this information on to future generations of women. This DVD package includes a bonus DVD with a long question and answer period Dr. Amen did with the audience. In addition, there is a great interview with Dr. Amen’s wife Tana, about feeding the female brain and creating brain healthy families.